I find it rather interesting the things that stand out from my childhood Christmas memories, but this one doesn't just stand out, I'm able to carry it on. 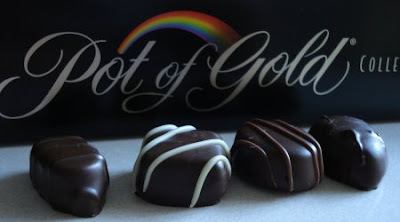 My father worked for the same lumber company for most of my childhood life, and every year for Christmas the company gave them 3 things for Christmas; a turkey, a gift certificate for a grocery store, and a box of "Pot of Gold" chocolates. Now, the first two things didn't interest me much, but the third one, well, that one always got my attention, not just because of my love of chocolate, but because it was wrapped. Our Christmas tree was always up when Dad came home with these goodies and I remember rushing to the door to meet him when he got home from work to get the box of chocolates to place under the tree, it was always the first "gift" under the tree, and in my childhood mind came to mean something so much more, the official start of my Christmas season. When I moved away from home, and had that first Christmas without my parents, it was just something I did, got a box of "Pot of Gold" for under the tree on tree trimming day and I've carried it on ever since. Oh, the box of chocolates isn't always "Pot of Gold" now, as they were sold to Hersey a few years ago and the chocolates inside were changed, and not much to my liking, and the box of chocolates is only wrapped if it comes that way, but still, the official start to the Christmas season in my home is the day the tree goes up and I place a box of chocolates under it, as a reminder to me of my childhood, and a way to keep my family close at this special time, even if it's only in spirit. What a special memory! We only had them at Christmas too. One of the things I remember about Christmastime is that's when the apple trucks went door-to-door selling Delicious Apples. It was many many years later that I realized that they weren't called Christmas Apples. My Grandmother is almost 105 and grew up in Nova Scotia. Today while I was visiting she told me about Moirs chocolates which she described as special to Nova Scotia (and I guess they were when she was a girl!).... I'll be off to hunt for some for her tomorrow. Sounds like they won't measure up to the pre-Hershey version but I'm sure they'll bring back fond memories!